Metro 2-Speed Dog Crate Fan. For Crates and Cages, Keeps pets cool. Product prices and availability are accurate as of 2018-11-29 22:04:45 GMT and are subject to change. Any price and availability information displayed on http://www.amazon.co.uk/ at the time of purchase will apply to the purchase of this product. Metro 2-Speed Dog Crate Fan Pets breath easier with the Metro® Air Force® Cage/Crate Cooling Fan. This deluxe, portable, high quality, high performance fan protects your pets from uncomfortable, dangerous hot weather and keeps them cool and relaxed...at home or away. It works on 2 "D" batteries to provide up to 100 hours of running time, with two speeds for maximum efficiency and powerful air circulation. Designed to be ultra quiet, it will never frighten your dogs. They remain cool, calm and comfortable, even on hot muggy days. The fan easily clips onto any standard cage, crate or pet carrier. 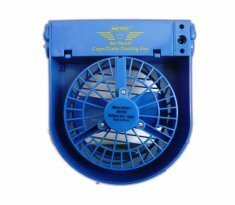 The Air Force® Cage/Crate Cooling Fan is just the thing for humid summer weather. At home or on the road it's the best way to help your pets keep their cool. Ideal for shows and short or long trips. Metro® Air Force® Cage/Crate Cooling Fan Powerful airflow Hangs easily onto any pet cage, crate or carrier Ultra quiet operation Up to 100 hours of cooling relief 2-speeds-high and low Keeps pet comfortable in all kinds of weather Ideal for home or travel Operates with 2 "D" batteries (not included) Please note that this crate fan was designed for the use with dogs. It can also be used with other animals like cats, ferrets and even rabbits. However, please bear in mind the much more timid nature of these animals compared to dogs, and that they may have to get used to the fan noise first before it can be installed in their enclosure.